Put the apple in a plastic bag. Add sweetener and cinnamon to bag. Shake, shake, shake, and enjoy. 150 members have added this recipe to their cookbook. My son, world's pickiest eater, LOVE these. Thank you! On the new Points Plus plan...this would be 0PP. Yum! Yum! I have never been a huge apple fan, but this simple addition of cinnamon (and sometimes a weeee ity bity tiny bit of sugar) and I am in love! Super quick and easy to pack with you for a snack or to curb a sugar craving. 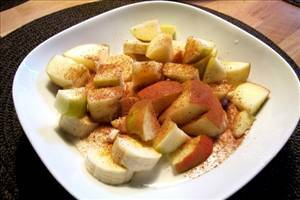 There are 91 calories in 1 serving of Cinnamon Apples.